Heather "Lil'Mama Hardy" began studying piano at the age of six and in the fourth grade started taking violin lessons. In high school, she studied violin with Richard Errante, a student of renowned teacher Rafael Bronstein. At the Manhattan School of Music, she studied with Bronstein himself. Heather next applied her talent in Greenwich Village, playing on the streets and in the subways. When classical training and precision collided head-on with improvisational, self-taught musicians, her unique style took root. 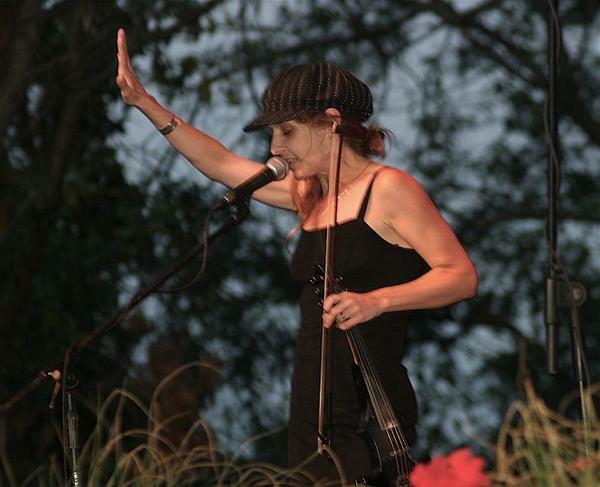 Moving to Tucson in 1992, she joined the Sam Taylor Band, originally as a featured violin soloist, but soon becoming a vocalist as well. Juxtaposing violin whispers with tasty, slamming wah wah captivated audiences and helped the band win the 1995 Arizona Blues Showdown. That was followed by taking second place in the International Blues Talent Competition in Memphis and a European tour. By 1997, Heather had formed her Lil'Mama band, taking it to New York in 1998. John Mayall considers her "absolutely brilliant". Her first solo CD, "Violins", was followed in 2000 by "I Believe". Heather has also been a featured guest on dozens of other recordings, including Arizonans Sam Taylor, Lisa Otey, Gerry Glombecki and Stefan George. is a full- blown, card carrying 'Blues Mama', with strong blues ties, who creates some of the most fascinating and deeply moving blues around. All accomplished with her violin! She plays her violin much like a guitar, bending and twisting notes with bow and strings like a demon unleashed, licks cascading like a frothing waterfall. Amazing! Heather may be small in stature but she stands tall in the grand spirit of the Blues. Heather believes in herself, taking the male dominated blues world by storm using her exhilarating talents of voice and violin, her nerve, and her insurmountable courage to succeed. She is an artist of vision and insight. Just Who Is Heather Hardy? She once played a secret concert in communist East Germany before the Berlin Wall fell and is in the Blues Hall of Fame. In her younger years she played in the NYC subway for tips and has toured Europe several times. She was trained as a classical symphony pianist and violinist at the prestigious Manhattan School of Music, but now plays blues and jazz. She has worked with the likes of Allen Ginsberg and the legendary Sam “Bluzman” Taylor. She won the 2011 TAMMIE for best string musician in Tucson. Many musicians would kill for a shot at some of those things. So who is this interesting person? She is Heather Hardy, and she lives and performs right here in Tucson! Heather was born in New Rochelle, NY, but her family quickly moved to Westport, CT. Her father was a medical illustrator, and her mother a teacher. The family had a great appreciation for the musical arts, and at age six Heather took up the piano. She says she immediately fell in love with it, but there was more, she fell in love with creating and performing music. In 4th grade, the school she attended offered every student the opportunity to study a string instrument. Heather really wanted to play the cello, but it was too heavy for a small girl to carry around. Her family convinced her to study the violin. She says she absolutely fell in love with it, and with the idea of playing in a symphony setting. She was selected for the All-State Orchestra and the Norwalk Youth Symphony and played with them during Jr. High and High School. In High School she had the honor to be selected for the American Youth Symphony and did her first European tour with them. After the MSM she started playing the subways and local parks, mostly for tips. She says this was a great opportunity to meet other musicians, learn from them, and develop her style. By this time she had switched from classical music to blues/jazz. One day, playing in Washington Square Park, she got “noticed. ” She was asked to join the False Prophets who recorded on the Alternative Tentacles label. They were fairly well known, especially in Europe. She joined them, and they toured Europe, Canada, and the US. I always like to ask musicians about the largest and smallest crowds they have played to. I am interested in the answer to the small crowd question, you can learn some things there. Are they only in it for money (large crowd) or because they enjoy interacting with their audience (small crowd)? Heather nailed this one perfectly. For the record, the largest crowd she has played to is “well over 5000” at a concert in Poland, with the False Prophets on a European tour. The smallest was only a few people at the Mint, here in Tucson. About this she says, “But it’s one of my favorite gigs. If it's only a small crowd, but they love music, then it's everything I need. And most of the time we have a great group that comes to hear the music and a great group of regulars and staff that also love music. I love playing there!” As a fan of live music that's exactly what I want to hear! Heather is passionate about supporting the Amity Foundation. Amity is a nonprofit which helps people with substance abuse problems. Their latest project is Dragonfly Village, which will include a complete resource center for children in families having problems with substance abuse issues. Heather's website is: www.heatherlilmamahardy.com. There you can keep up to date on her tour schedule, see some live video, or download music.